Hollister, CA- Corbin announced today that they have designed a new seat specifically for the 2013 Harley-Davidson Softail Breakout FXSB. 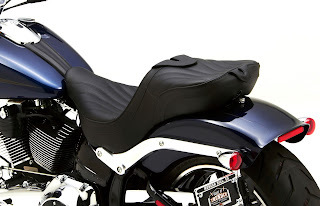 This new Dual Tour Saddle will improve the comfort, feel and looks of your new Harley. It will also greatly increase your long distance range capabilities due to the incredible comfort…both for rider and passenger. The only reason you'll find for stopping is the need for fuel. Corbin has a long history of designing saddles that look as good as they perform and this Dual Tour is no exception. Designed to give riders the next level of comfort, this saddle features genuine leather, a new seat cover design and ergonomically designed seating for maximum weight dispersion. Each seating area is sculpted for proper weight distribution which allows long range capability. Generously contoured platforms eliminate hot spots and centralized pressure that causes discomfort. 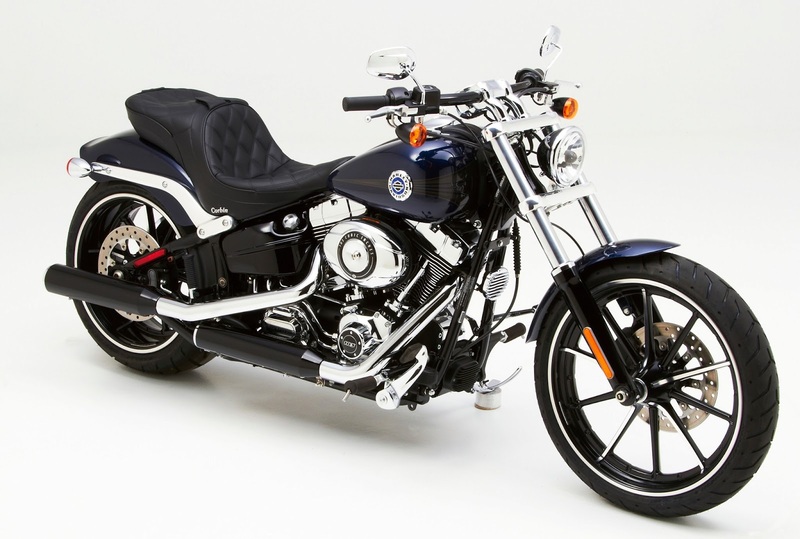 Specially designed to fit perfect on the Softail Breakout model, notice how closely the Dual Touring saddle matches up to the Harley tank. Corbin sculpted the nose of the saddle to make it narrower and allow an easier reach to the ground. Smaller riders merely slide forward and out of the bucket slightly to have better ground reach at stop signs and in parking lots. Yet long range riding comfort is maintained with a wide, generous bucket to support your posterior. Designed to work with a Corbin backrest in the rider and/or passenger seating positions, Corbin backrests are supported by internal hardware for a very clean look and simple, one-bolt installation. You can order a single backrest and transfer it front to back as needed or get two for full time use. Backrest angle adjusts to provide a personalized fit to rider posture in both positions. In the front position, our special hardware allows positioning of the backrest fore & aft for riders of different stature. This special hardware also features a fold down action to ease mounting the bike. 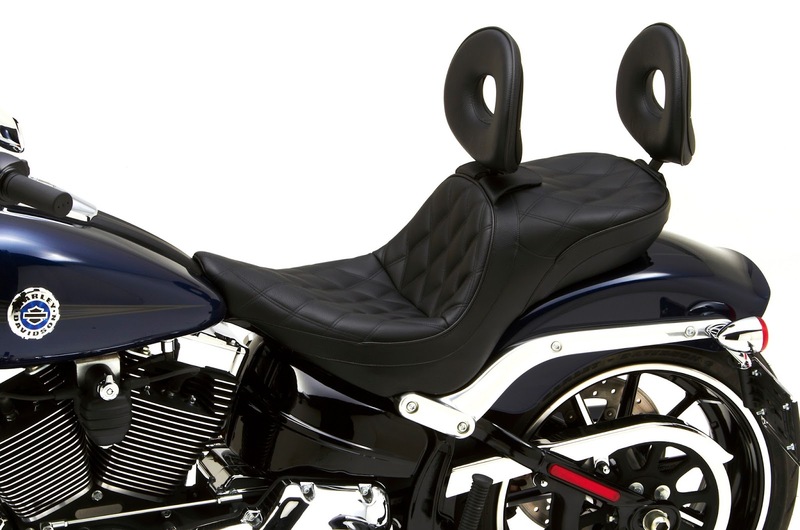 With backrest installed, the rider bucket offers 17 inches of vertical support! On the inside, Corbin’s exclusive Comfort Cell® foam material gives firm support that conforms to your body. We offer two different stitch patterns on this model as well as the option of chrome studs all at no extra charge. And as an added bit of luxury, the Dual Tour offers the option of electric seat heaters for those chilly morning rides. Corbin's heater comes completely pre installed in the saddle and you need only integrate the included pigtail to your battery. Separate controls for rider and passenger provide for independent operation.